The Model GAO2902/2904/25216A Digital Storage Oscilloscopes DSO/Logic Analyzer integrates two (or four) 250 MSa/s single-shot digitizers with a 250 MHz, 8 (or 16) channel logic analyzer and FFT Spectrum in a single low-cost instruments. DSO slashes the cost of capturing and analyzing signals on up to 50 MHz microprocessors, logic families, and analog circuits on systems. The GAO2902/2904/25216A DSO/Logic Analyzer costs about 1/5 the price of other PC-based or stand-alone DSOs. The DSO contains fully synchronized cross triggering. You can capture and display analog events that affect your digital circuits, or vice-versa, and correlate the two to identity cause and effect relationships. 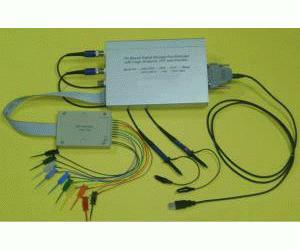 The logic analyzer can act as 8 (or 16) channel pattern trigger input for the DSO. Or the oscilloscope can trigger the logic analyzer when an analog signal crosses threshold. The display screen shows the full 128K/256K/512K/1Mega sample deep data buffers for both the analog waveform and the digital data pattern. All-channel zoom expansion and cursors identify synchronous events on different channels. The DSO connects via the parallel port or USB port so you run it from a Notebook, Laptop or a Desktop PC. The ultra-compact size allows you take it with you-wherever you go. Use of your PC for processing, display, and data storage saves your time and money. Make measurements in your first half-hour due to the easy installation and simple single keystroke operation-no multilayer menus to stumble through. The instrument responds instantly, like an analog oscilloscope, to setting changes. Since the instrument resides in your PC, so does the data-no programming required for data transfers. You can store an unlimited number of waveforms and timing patterns to floppy or hard disk for later recall. Named set up panels can also be saved and recalled from disk.